Today’s blog post will be in English because we have celebrated the first ”International school meals day”. This post is my way of spreading what we do in our school restaurant to satisfy the children’s need for nutritional food to help them get through the school day. We believe that the school restaurant should be like any other lunch restaurant, serving good food in a nice atmosphere! In Sweden, school lunches are free for all students in grade school. The school law states that every school meal should be free, nutritional, and that children with cultural, religious or medical needs are entitled to special meals. I work at, and manage a school restaurant where 510 children between the ages of 6 and 12 eat their lunch; we also have about 60 teachers and other staff members that eat our food every day. Teachers are furthermore allowed to eat for free if together with their pupils, the so called pedagogic meal. The purpose is to consider the meal times as a part of the education, teaching children to sit down and eat a proper meal, but also to learn proper conduct and how to interact with other persons in a dining situation. Today was, as you are all aware of (or maybe you have missed it), celebrating the International school meals day. The idea comes from the UK and the USA where they try to raise awareness of the importance of a proper school meal. For students to be able to take part of, and get the most out of their education they need to eat a healthy and nutritional meal. Sadly, many countries around the world does not offer free school meals to all of their students in grade school. Sweden, Finland and Estonia are the only countries in the world with free school meals for every child. In other countries, meal programs for underprivileged children are in place, but not for every child that attend school. Working with school meals in Sweden, I feel proud of the system that we have created because I believe that there is a clear relationship between good, nutritious school meals and good grades. Together with my colleagues we want to set a good example of the foods you can prepare and serve to school children. 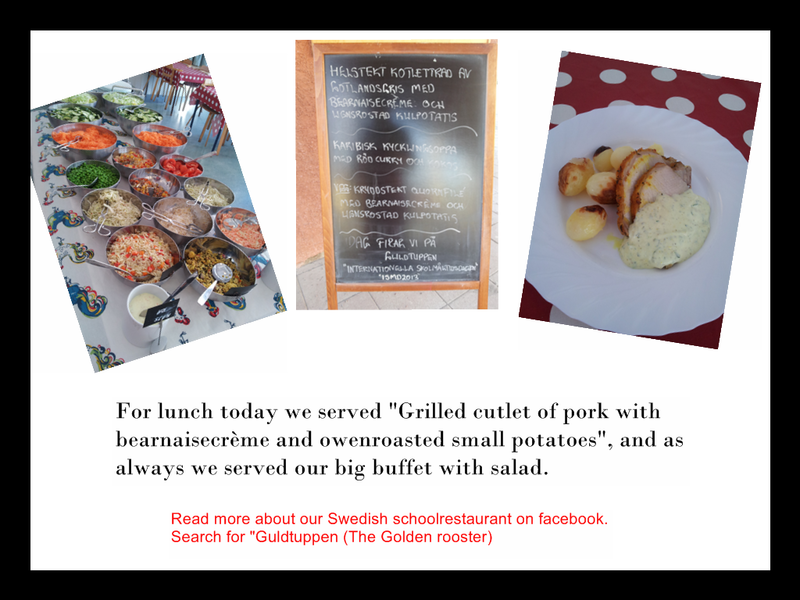 For lunch today we served ”Grilled cutlet of pork with béarnaise crème and oven roasted small potatoes”, and as always we have a big salad buffet with a variety of different salads. We also served a soup (as we do every day). Today it was a ”Caribbean chicken soup with red curry and coconut milk”. And for the vegetarians we have a separate meal, but this is also available for anyone who wants to taste it. I hope we are able to inspire you, and you are most welcome to visit our school restaurant’s Facebook page. Even if you don’t understand the Swedish language, you can hopefully get some ideas from our pictures. So check out ”Guldtuppen” on Facebook and see how we do things in Sweden. If you like this post you can always follow me either on Facebook, ”Skolkocken” or through my twitter account with the same name. But remember that most of the things I write is in Swedish.